Fisherpoets and fans are schooling up. We'll see you in Astoria! We've got a terrific Ray Troll FisherPoets Gathering T-shirt in the works. Our regular favorite venues are hosting us again: The Wet Dog Cafe, The Voodoo Room, The Columbian Theater, The Astoria Event Center, The Lovell Showroom at Fort George Brewery, KALA Gallery, The Columbia River Maritime Museum's Barbey Maritime Center. The Liberty Theater invites us in as well Saturday night. Pier 39 that morning. We'll have open mic again Friday and Saturday afternoons at WineKraft and a Singers' Gathering late Saturday night. Imogen Gallery will show fisherpoet artist George Wilson's watercolors from a season fishing in Kodiak's Uganik Bay. FisherPoets Gathering workshops will feature knot tying, song writing, Columbia River and Bristol Bay watershed health, global ocean health, creative writing, singing and story circles. Evenings Corey Arnold will project images again on the wall of that building. 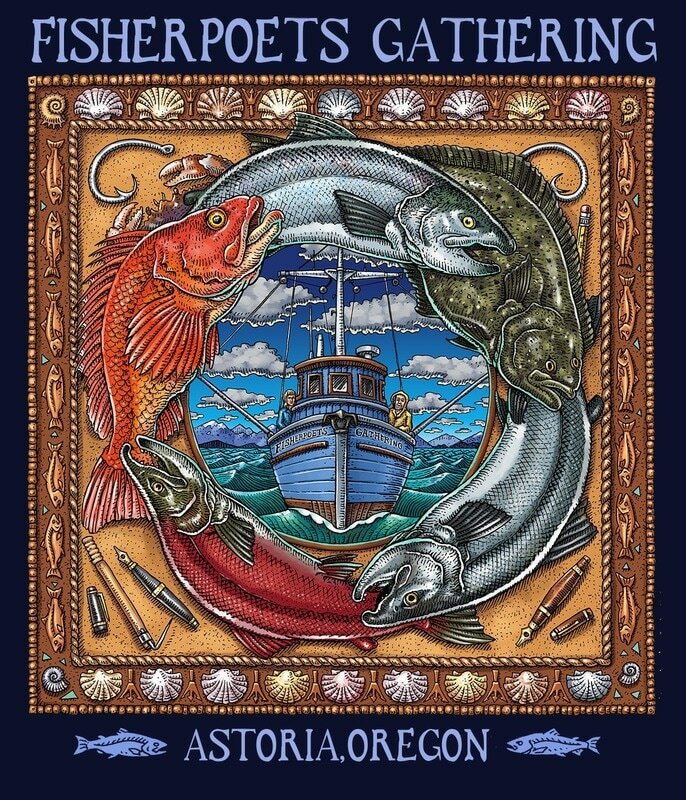 Admission buttons will be available at venues and a handful of downtown Astoria businesses the week of the Gathering. The paint on the 2017 Evening Reading Schedule and the Special Events Schedule is dry. ​Meanwhile, here is a list of fisherpoets who'll be joining us for our 20th annual FisherPoets Gathering in February, a hundred fisherpoets from a dozen states, provinces or countries. Newcomers in green, of course.